While often overlooked, the gums play a critical role in keeping the entire smile healthy. 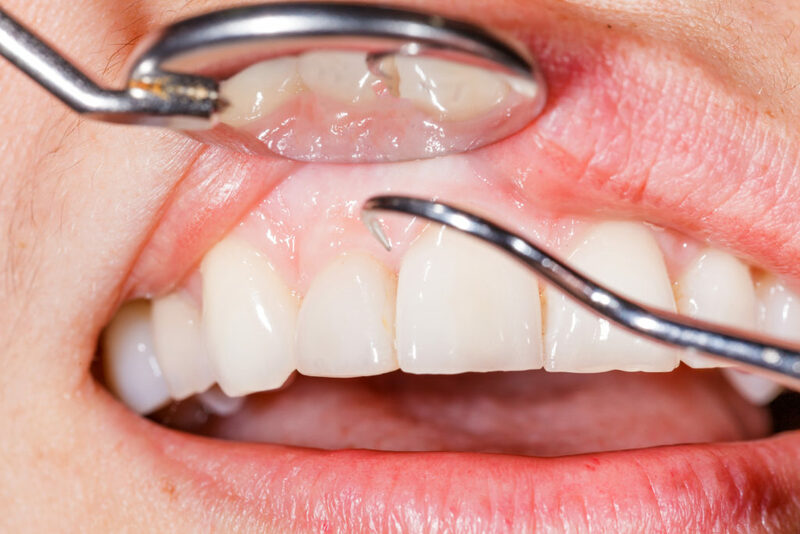 When compromised by gum disease or damaged by dental trauma, patients can find themselves facing oral discomfort and vulnerable to a wealth of potential dental issues. With these consequences in mind, our Park City Dental dentists strive to educate patients on the importance of caring for each part of the smile. For lasting gum health, consider integrating the following steps into your oral hygiene routine at home. Daily brushing cleans not only the teeth, but also the gums. By brushing teeth when you get up and before you sleep, patients reduce the amount of bacteria on teeth and along the gum line. This prevents the accumulation of plaque which occurs over the course of the day. Our Park City Dental team also recommends brushing after meals – doing so removes leftover food from contributing to the growth of bacteria and leaves patients with a fresh smile. When cleaning teeth, it’s important to be thorough as well as comprehensive. As more than 40% of your tooth’s surface area lies in the spaces between teeth, flossing regularly becomes an important element of proactive gum and oral care. For maximum effect, be sure to use waxed string and gently guide the floss into the spaces between teeth. Rather than using a sawing motion, pull the floss into a c-shape around the tooth and gently scrub. Repeat this process around each tooth, including those at the end of the arch – food and plaque can become trapped between the last teeth and soft tissue. While most patients know to brush and floss daily, few are aware of the importance of incorporating a dental pick into their usual routine. Like the pick used by your dentist during regular cleanings and check-ups, this dental instrument is used to clean the space between the gum line and tooth, an area often missed by toothbrushes and floss. The benefit of a rubber dental pick is that, as the tip is rubber rather than metal, this instrument is safe for use on a regular basis, helping maintain clean smiles between dental visits. At-home dental picks are available at most drug stores as well as online. After completing your daily hygiene routine, it’s important that patients finish with an anti-septic mouthwash. Found in your local drugstore, there a number of different types available based on your needs. For improved gum health, be sure to choose an anti-plaque or anti-gingivitis option to help flush away gum disease-causing bacteria. Beyond proactive dental care, your diet also plays an important role in the long-term health of your smile. As a result, our dentists recommend that patients limit their sugar intake, substituting unhealthy sweets and sodas for fresh produce and water. Incorporating hard, crunchy snacks can help “scrub” teeth, removing bacteria while water helps wash away leftover food and bacteria without introducing acid or sugars to the smile. Keeping your smile healthy well into the future starts with creating healthy at-home habits followed by regular visits to our Wichita dentists twice a year. To learn more about your treatment options, call Wichita dentist, Park City Dental to schedule your next cleaning and examination.